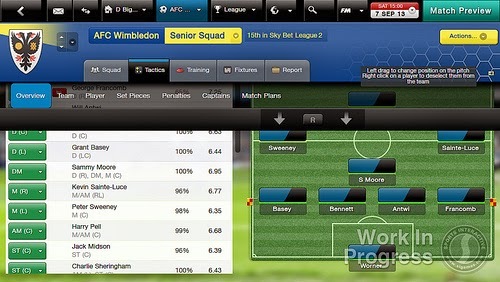 Football Manager is a complex yet rewarding simulation setting players behind all the details in managing this sport. Trades, negotiations, dealing with unhappy players... if all this is something you might like and have hours to possibly drop this game may be for you. Originally released as a PC game (and received pretty highly), the "Classic" version of the game will now be available on the go on your Vita. Cross-save is included to continue your managing at home on your PC out on the road via cloud saves. "Football Manager Classic started as a 'slimmed down' game mode in Football Manager 2013, specifically designed as an alternative, less time-consuming way for players to approach the game. The release of FMC 2014 for PS Vita marks the first time that it's been released as a standalone game." The following video is not a Vita trailer, but a run down on the Classic version of the game. Checking out the trailer reveals a lot of spreadsheets... is this something you'd spend time on? No word on a western release, but considering our knowledge of what we think "football" is, I wouldn't hold your breath. What do you think? Is this a keeper? Will it be your goal to tackle this? Or will you pass?